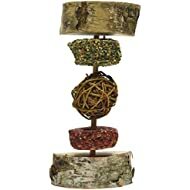 Hang in your pet's home to enrich their environment and provide a stimulating challenge. 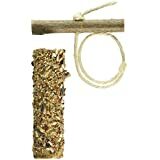 Ideal for most seed eating pet birds including budgies, cockatiel and most other parrots. My parrot loves these and it keeps her busy. The first one crashed to the bottom of her cage because she ate through the ribbon but a strong cup hook resolved the problem. We did this as soon as we put a new one in her cage. A pecking light lasts about two weeks which is great because she normally wrecks toys very quickly. She loves cabob but they are finished too quickly and are pricey to replace. brought for my 2 budgies and as soon as i hang it in there cage they went straight to it, they seem to love it. good product and good price. 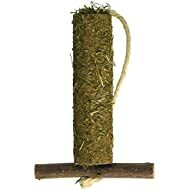 nice little treat for your pet birds. Kept my parrot busy for a couple of weeks until he totally destroyed it, but it's what he likes to do. Smells delicious, but my budgies are to scared of it to go near it! It usually takes them a few months with something new in the cage before they like it. But this smells good, if I were a budgie, i'd eat it! 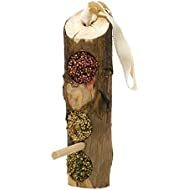 already had one of these before for my african grey parrot.even after he manages to get all the food out he continues to try and destroy the hard wood.great value and great toy for my bird. Great quality. The budgie loves it - eating, chewing, sitting on the perch and on top of it. We've had it a while and he hasn't pecked through the string yet but certainly likes trying. My cockatiels were scared of this at first and didnt like it when hung but when used as a perch/bridge they love it and pecked at the seeds. Little bit hard for birds to know what it is, but once they noticed what they are meant to do they loved it!! 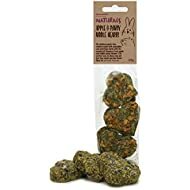 Very god quality, & looks natural, after they finished eating it it can be used as foraging, I put crinkle paper in it with a few treats.